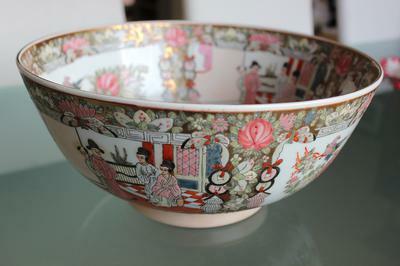 I received the attached Rose Medallion bowl as a wedding present some 10 years ago and I thought of trying to research some more information about it and establish its authenticity. It is 12 inches in diameter and 5.5 inches in height. No obvious damage or chips. It has a nice ring to it when tapped and has a Qianlong stamp at the bottom. The colours and design generally look better than what I've seen on other examples while looking at internet photos. Thanks for the feedback =)Much appreciated. This item looks as if it was made within about the last two decades, fairly recent. 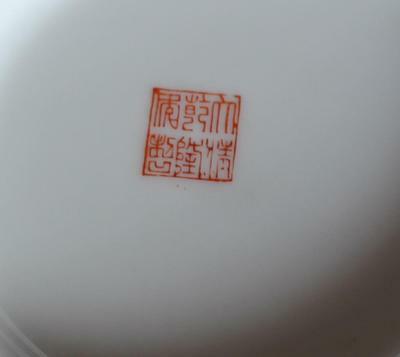 The Mark is indeed a Qianlong mark, but it is apocryphal and for decoration only. 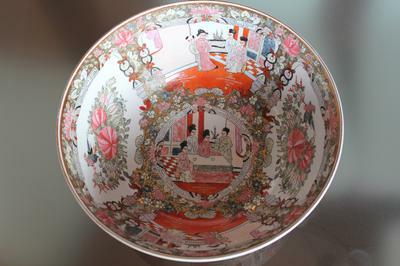 Rose medallion porcelain seem to be still produced today, probably due to its popularity in the west. The original rose medallion was made exclusively for export.